N4U Guesthouse is located in the most beautiful part of Florence, right in front of the Bargello between Piazza del Duomo and Piazza della Signoria, in Via del Proconsolo. The Uffizi gallery is one-minute walk from the N4U Guesthouse. Santa Maria Novella (the central train station) is within easy reach at only 1145 meters away. In only one minute, you can reach the Uffizi Gallery and the most important shopping area of Via Roma, Via dei Calzaiuoli and Piazza della Repubblica. 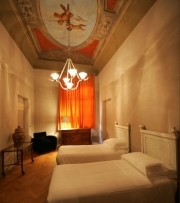 Palazzo Rucellai, the Cappella dei Medici and Ponte Vecchio are only 3 minutes walk away. N4U is not a hotel. 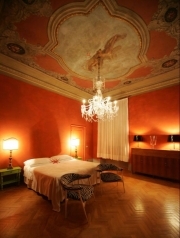 Each room is a splendid part of a house that still has its original ceilings and floor decorated with paintings from the era. The magnificent chandeliers from different origins and periods belong to the owner’s private collection and are used light all the rooms and common areas. Staying at N4U means that you are the type of person who wants to be surrounded by beautiful things……even when travelling. All the Rooms, have WiFi Internet, Air Conditioning , Minibar, Private Baths, we will give you comfortable bathrobes and sleepers. All baths have equipped with rain effect system showers, warmer towels and hairdryer. All the Rooms with external views by the Historical Center of Town. Notes Check in/out N4U guest House is not a hotel, every person is given a personal welcome. Check-in is available from 2.00 pm to 6.00 pm.